On Saturday, Pawtucket edged Buffalo 5-4. Charlie Zink went 5 1/3 innings allowing 2 runs on 3 hitsand 4 BB. He had 2 Ks. Barry Hertzler went 1 1/3 innings giving up 0 runs on 1 hit and a BB. He had a K. Phil Seibel also went 1 1/3 innings. He gave up 2 runs on a hit and a BB, He had 3 Ks. Craig Breslow finished off the last 1/3 of an ining. He gave up a BB. Trent Durrington was 1 for 2 with 2 runs scored. Dustin Pedroia went 1 for 3 and scored a run. David Murphy went 1 for 3 with a home run and 3 RBI. Reading edged Portland 2-1. Chris Smith pitched 6 innings giving up 2 runs on 4 hits and a BB. He had 5 Ks. Mike Bumatay went 1 scoreless inning. He gave up a hit and had 2 Ks. Edgar Martinez went 1 perfect inning with a K. Dusty Brown went 1 for 3 with a RBI. Wilmington defeated Kinston 5-1. Matt Goodson went 5 innings. He gave up 1 run on 5 hits. He had 7 Ks. Bryce Cox went 1 2/3 innings. He did not allow a run or a hit. He gave up 2 BB and had a K. Justin Sturge amazingly gave up 4 hits in an inning but did not allow a run. He had a K. Ryan Schroyer went the final 1 1/3 innings. He did not allow a hit but gave up a BB. He had 2 Ks. Bryan Pritz went 3 for 4 with 2 RBI. Jed Lowrie went 2 for 4 and scored a run. John Otness went 2 for 4 and scored a run. Jeff Corsaletti went 2 for 4 with a run scored and a RBI. Jeff Natale went 2 for 2, scored a run and had a RBI. Lakewood got by Greenville 5-4. Clay Buchholz pitched 5 scoreless innings. He allowed 3 hits and a BB. He had 4 Ks. Kyle Fernandes went 2 innings blowing the save when he gave up 3 runs on 3 hits and a BB. He had 2 Ks. Jason Blackey was also credited with a blown save and the loss. He went 1 2/3 innings giving up 2 runs on 3 hits. He had a K. Yahmed Yema went 2 for 4. Tony Granadillo went 1 for 3 with a run scored and a RBI. Lowell defeated Vermont 4-1. Mario Pena went 6 innings. He gave up 1 run on 5 hits. He did not walk a batter and had 2 Ks. Yulkin German went 2 scoreless innings giving up 2 hits and 2 BB. He had 2 Ks. T.J. Large pitched a perfect inning striking out all 3 hitters he faced. Bubba Bell went 2 for 4 with a run scored and a RBI. Zak Farkes went 2 for 3 and scored 2 runs. Luis Segovia went 2 for 2 and had 2 RBI. In the GCL, the Red Sox edged the Twins 4-3. Ryan Colvin went 1 1/3 innings. He gave up a run on 1 hit and 2 BB. He had a K. Jose Capellan got the win going 5 innings. He gave up 1 run and had 7 Ks. David Timm went 1/3 of an inning. He gave up a BB. Will Mann went 2 1/3 innings. He allowed 1 run on 2 hits and a BB. He had 2 Ks. Jason Place went 2 for 4 with a home run and 2 RBI. Jon Egan went 2 for 3 and scored a run. Player of The Night: Bryan Pritz who went 3 for 4 and drove in 2 runs. On Friday, Toledo doubled the score on Pawtucket 8-4. Kason Gabbard went 4 2/3 innings and took the loss. He gave up 5 runs on 5 hits and 3 BB. He had 5 Ks. Tim Bausher went 2 1/3 innings allowing 3 runs on 4 hits and a BB. He had 2 Ks. Adam Stern went 2 for 5. Dustin Pedroia went 2 for 3 and scored a run. David Murphy went 1 for 3 with 2 runs scored and a RBI. Portland blanked Reading 6-0. Frank Brooks got the win pitching 7 innings of 1 hit ball. He did not walk a batter and had 4 Ks. Randy Beam pitched 1 perfect inning of relief. Jon Searles also threw a scoreless inning allowing 1 hit. Luis Jimenez went 2 for 4 and scored a run. Dusty Brown went 2 for 4 scoring 2 runs and driving in another. David Bacani went 3 for 4 with a run scored and 2 RBI. Wilmington scored 3 times in the bottom of the ninth to edge Kinston 5-4. Tommy Hottovy went 6 innings giving up 4 runs on 8 hits and a BB. He had 9 Ks. Scott Shoemaker went the final 3 innings for the win. He did not allow a run on 3 hits. He had 3 Ks. Jay Johnson went 2 for 3 and scored a run. John Otness went 2 for 4. Iggy Suarez went 1 for 4 but that hit a double drove in the tying and winning run in the bottom of the 9th. Lakewood edged Greenville 2-1. John Barnes took the loss going 5 innings. He gave up 2 runs on 3 hits and 4 BB. He had 6 Ks. Ismael Casillas went 2 scoreless innings of relief. He gave up 1 hitand struck out 4. Hunter Jones pitched a perfect inning of relief and had 2 Ks. Aaron Bates went 2 for 4. Lowell got by Vermont 7-5. Keith Foulke threw 1 perfect inning with a K. Travis Beazley went 3 2/3 innings. He allowed 1 run on 4 hits and 2 BB. He had 3 BB. Josh Papelbon threw another perfect 9th with 1 K. Bubba Bell went 3 for 4 with 2 runs scored. Zach Daeges went 2 for 4 with a home run and 3 RBI. Reid Engel went 2 for 4. In the GCL, the Red Sox were leading the Reds 2-0 when play was suspended in the bottom of the first inning. Player of The Night: Frank Brooks who went 7 scoreless innings allowing just 1 hit. He did not allow a BB and had 4 Ks. On Thursday, Pawtucket blanked Toledo 3-0. Jason Johnson went 7 innings allowing 2 hits and 2 BB. He had 4 Ks. Craig Breslow finished the game going 1 perfect inning. He has 1 K. Adam Stern went 2 for 5 with a home run and 3 RBI. Willie Harris went 2 for 4. Portland did not play. Wilmington edged Kinston 4-3. Gary Galvez went 7 innings allowing 3 runs on 7 hits and 3 BB. He had 3 Ks. Beau Vaughn got the win going 1 scoreless inning. He gave up 1 hit and had 2 Ks. Andrew Pinckney went 3 for 3 with a run scored and a RBI. Jeff Natale went 1 for 2 with 2 RBI. Delmarva downed Greenville 8-1. Chris Jones went 5 innings allowing 2 runs on 3 hits and 3 BB. He had 5 Ks. Tim Cox had a rough outing allowing 6 runs on 7 hits in 3 innings of work. He had 1 K. Mickey Hall went 1 for 2. Mark Wagner went 1 for 3. Lowell edged Aberdeen 4-3. Brian Steinocker went 4 innings allowing 3 runs on 7 hits. Dustin Richardson went 3 scoreless innings. He gave up 4 hits and had 2 Ks. Jean Guillen threw a scoreless inning giving up 0 hits and 1 BB. He had a K. Josh Papelbon finished it off with a perfect inning of relief that included 2 Ks. Manny Arambarris went 2 for 4 with 2 RBI. Zach Daeges went 1 for 2 and scored twice. Finally in the GCL, the Red Sox got by the Reds 3-2. Mauricio Mendez went 4 scoreless innings allowing 2 hits and a BB. He had 6 Ks. Gustavo Selcedo went 1 1/3 innings. He gave up 2 runs on 2 hits and 4 BB. He had 1 K. Wang-Yi Lin got the win throwing 2 2/3 scoreless innings. He gave up 2 hits and a BB. David Timm finished up going 1 scoreless inning while giving up 2 hits. Carlos Fernandez-Oliva went 2 for 4 with a RBI. Argenis Diaz went 1 for 3 and scored a run as did Matt Sheely. Jason Place went 1 for 3. Player of The Night: Andrew Pinckney who went 3 for 3 with a run scored and a RBI. On Wednesday, Pawtucket edged Toledo 6-5. Abe Alvarez got the win giving up 3 runs on 3 hits and 4 BB over 5 innings. He had 5 Ks. Phil Seibel went 1 1/3 innings. He did not allow a run or a hit. He had 1 BB and 3 Ks. Javier Lopez closed it out going the last 2 innings allowing 0 runs, 0 hits and 3 BB. He had 2 Ks. Adam Stern went 2 for 5 with a run scored and a RBI. Trent Durrington went 2 for 3 and scored a run. Jeff Bailey went 3 for 5 with 2 runs scored and 2 RBI. Reading defeated Portland 10-6. Luis Mendoza went 5 1/3 innings allowing 4 runs on 6 hits and 4 BB. He had 7 Ks. Kyle Jackson went 1 1/3 innings. He gave up 2 runs on 3 hits and 2 BB. He had 3 Ks. Rusty Tucker went an inning allowing 1 run on 2 hits and a BB. Mike Bumatay also went an inning giving up 3 runs on 2 hits and 2 BB. He had 1 K. Jacoby Ellsbury went 2 for 3. Dusty Brown went 3 for 4 with a home run and 3 RBI. Wilmington lost the suspended game to Salem 4-3 in 16 innings. Andrew Pinckney went 2 for 6 and scored a run. John Otness went 2 for 6. Jed Lowrie went 1 for 7 with a home run and 2 RBI. Five pitchers were used during the marathon contest. Andrew Dobies went 6 innings. He gave up 1 run on 7 hits. He had 4 Ks. Justin Sturge went 4 innings. He did not allow a run on 2 hits. He had 4 Ks. Jason Richardson ended up taking the loss going 2 2/3 innings while allowing 1 run on 4 hits and 2 BB. He had 2 Ks. The team then proceeded to drop the scheduled game 1-0. Kevin Guyette went 6 innings. He did not allow a run on 5 hits and a BB. He had 4 Ks. Bryce Cox went 2 scoreless innings. He allowed 2 hits while striking out 2. Ryan Schroyer went 2/3 of an inning allowing the winning run to score on 1 hit and 2 BB. He had 2 Ks. Jeff Corsaletti, Jed Lowrie, and Andrew Pinckney were all 1 for 3. Greenville edged Delmarva 3-2. Ryan Phillips went 5 2/3 innings. He allowed 1 run on 2 hits and 3 BB. He had 7 Ks. Chad Rhoades went 1 2/3 innings allowing a run on 3 hits and a BB. Blake Maxwell pitched a scoreless 1 2/3 innings. He allowed 1 hit and recorded a K. Tony Granadillo went 2 for 4 with 2 home runs. Lowell edged Aberdeen 9-8. Bubba Bell went 2 for 5 with 2 runs scored and a RBI. Zach Daeges went 2 for 4 with a RBI. Luis Exposito went 2 for 4 with a run scored and a RBI. Jorge Jimenez went 2 for 4 with a run scored and 3 RBI. Manny Arambarris went 5 for 5 with 2 runs scored and an RBI. Kris Johnson went 2 innings allowing a run on 1 hit. He had 1 K. Ryne Lawson went 3 2/3 innings giving up 6 runs on 7 hits and a BB. He had 3 Ks. Yulkin German was credited with the win. He went 2 scoreless innings allowing 3 hits and 0 BB. He had 1 K. T.J. Large went 1 1/3 innings allowing 1 run on 3 hits and a BB. He had 4 Ks. In the GCL, the Red Sox got by the Padres 5-3. Kris Negron went 3 for 4 and scored 2 runs. Chih-Hsien Chiang went 2 for 4 with 2 RBI. Chih-Hsiang Huang went 2 for 3 with a home run. Argenis Paulino went 2 innings giving up 1 run on 2 hits and a BB. He had 1 K. Emilis Guerrero got the win going 5 innings. He allowed 2 runs on 6 hits. He had 5 Ks. Miguel Socolovich went 2 scoreless innings allowing 1 hit and a BB. Player of The Night: Manny Arambarris who went a perfect 5 for 5 at the plate while scoring 2 runs and driving in another. On Tuesday, Pawtucket fell to Toledo by the score of 3-1 in 10 innings. Willy Harris went 2 for 5. David Pauley went 7 innings giving up just 1 run on 3 hits and a BB. He had 4 Ks. Brad Baker took the loss going 2 1/3 innings. He gave 2 runs on 6 hits. He had 3 Ks. Portland mauled Reading 12-4. Jacoby Ellsbury went 2 for 5 with a run scored and a RBI. Brandon Moss went 2 for 4 with 2 home runs, 3 runs scored and 3 RBI. Luis Jimenez went 3 for 5 with a run scored and 2 RBI. Jeremy West went 2 for 4 and scored 3 runs while driving in another. Chris Durbin went 2 for 5 with a run scored and a RBI. David Bacani went 2 for 5 with a run scored and 2 RBI. Devern Hansack got the win going 6 innings. He allowed 2 runs on 8 hits and a BB. He had 3 Ks. Jon Searles went 2 innings giving up 2 runs on 3 hits. He had 4 Ks. The Wilmington - Salem game was suspended after 15 innings due to a local curfew with the score tied 3-3. The game will resume this evening. Greenville edged Delmarva 4-3. Mickey Hall went 2 for 2 with a run scored and a RBI. Yahmed Yema went 2 for 4 as did Mark Wagner. Michael Bowden started and went 4 innings. He allowed 3 runs on 3 hits and 6 BB. He had 4 Ks. Kyle Fernandes went 2 scoreless innings allowing 1 hit and 2 BB. He had 2 Ks. Hunter Jones pitched 2 scoreless innings allowing just 1 hit to pick up the win. He had 2 Ks. Aberdeen humiliated Lowell 13-1. Zach Daeges went 4 for 4. J.T. Zink went 4 innings allowing 6 runs on 9 hits and a BB. He had 2 Ks. Ting-Jen Yeh went 1 inning. He gave up 3 runs on 3 hits while striking out 3. Felix Ventura went an inning. He gave up 4 runs on 4 hits while striking out the side as well. Justin Masterson went the final 2 innings. He did not allow a run on 1 hit. He had 4 Ks. In the GCL, the Pirates defeated the Red Sox 2-1 in a 7 inning game. Luis Sumoza went 1 for 2 with a RBI. Matt Sheely also went 1 for 2. Felix Doubront went 6 innings giving up 1 run on 3 hits and 2 BB. He had 2 Ks. David Timm went 2/3 of an inning and took the loss. He gave up the winning run on 2 hits. Player of The Night: Brandon Moss who went 2 for 4 with 2 home runs, 3 runs scored and 3 RBI. In action on Monday, Pawtucket blasted Columbus 9-2. Adam Stern went 2 for 5 with a run scored and a RBI. Dustin Pedroia went 2 for 4 with a run scored. Tyler Minges went 2 for 5 with 2 runs scored. Alex Machado went 3 for 5 with 2 runs scored and 2 RBI. Charlie Zink started and got the win going 7 innings. He gave up 2 runs on 5 hits and a BB. He had 5 Ks. Craig Breslow pitched 2 hitless innings with 3 Ks for the save. Portland got by Reading 5-3. Jacoby Ellsbury went 2 for 4 with a run scored. Brandon Moss went 2 for 3 with a run scored and a RBI. Jeremy West went 1 for 4 with a home run and 3 RBI. Jose Vaquedano went 6 innings for the win allowing 3 runs on 8 hits and 2 BB. He had 5 Ks. Edgar Martinez got the save going 2 innings while giving up 2 hits, 0 BB and a K. Wilmington defeated Salem 5-1. Matt Goodson pitched the complete 7 inning game for the win. He allowed the single run on 4 hits and a BB. He had 3 Ks. John Otness went 2 for 3 and scored 2 runs. Andrew Pinckney went 3 for 4 with a run scored and a RBI. Iggy Suarez went 2 for 2 with a run scored. Delmarva defeated Greenville 5-1. Yahmed Yema went 3 for 4. Tony Granadillo went 2 for 4 with a run scored. Christian Lara went 2 for 4 with a run scored. Mike Rozier was tagged with the loss. He went 5 1/3 innings giving up 3 runs on 3 hits and 4 BB. He had 2 Ks. Ismael Casillas went the final 2 2/3 innings allowing 2 runs on 2 hits. He had 3 Ks. Lowell was not scheduled yesterday. In the GCL, the Red Sox split a doubleheader with the Twins. They lost the first 5-0. Ryan Colvin went only 1 1/3 innings while giving up 5 runs on 7 hits. He had 1 K. Joseph Guerra pitched 4 2/3 scoreless innings. he gave up 4 hits and had 2 Ks. Carlos Fernandez-Oliva, Jason Place,and Matt Sheely accounted for all the offense each going 1 for 3. They rebounded to edge the Twins 4-3 in the second contest. Jose Capellan started and went 4 innings. He gave up 2 runs on 5 hits. He had 2 Ks. Carlos Gonzalez got the win going 1 inning while giving up a run on 3 hits. He had 2 Ks. Mauricio Mendez pitched the final 2 innings allowing 0 runs on 1 hit and a BB. He had 2 Ks. Jason Place went 2 for 3 with a RBI. Carlos Fernandez-Oliva went 2 for 3 with a RBI. Player of The Night: Alex Machado who went 3 for 5 with 2 runs scored and 2 RBI in Pawtucket's win. On Sunday, Pawtucket got by Columbus 6-4. Leadoff hitter Adam Stern went 3 for 4 with a run scored. Alex Machado went 2 for 4. Ken Huckaby went 2 for 5 with 2 RBI. Ron Calloway went 2 for 5 and scored a run. Dustin Pedroia had 1 hit in 2 at bats, a three run homer.Scott Shoemaker started and went 5 innings. He gave up 4 runs on 5 hits and 2 BB. He had 6 Ks. Barry Hertzler went 2 innings. He did not allow a run on 3 hits and a BB. He had 1 K. Javier Lopez pitched the final 2 innings allowing a hit and a BB. 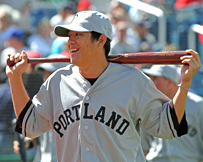 He had 1 K. Portland lost both games of a doubleheader. Binghampton took the first game 9-6. Jacoby Ellsbury went 2 for 5 with a RBI. Luis Jimenez went 2 for 4 with 2 RBI. Chris Smith went 5 1/3 innings allowing 7 runs on 7 hits and 5 BB. He had 2 Ks. Binghampton won the second game 7-0. Mets pitcher Miguel Pinango tossed a no-hitter against the Sea Dogs. Frank Brooks went 3 innings allowing 6 runs on 5 hits and a BB. He had 4 Ks. Kyle Jackson threw 2 scoreless innings. He gave up 1 hit and a BB. Rusty Tucker pitched the final 2 innings. He allowed 1 run on 3 hits. He had 2 Ks. Lynchburg edged Wilmington 3-2 in 10 innings. Bryan Pritz went 1 for 4 with 2 RBI. Iggy Suarez went 1 for 3 with a run scored. Tommy Hottovy went 5 1/3 innings. He gave up 1 run on 3 hits and 2 BB. He had 5 Ks. Ryan Schroyer went 3 innings. He gave up 1 run on 2 hits and 2 BB. He had 2 Ks. Justin Sturge went the final 2/3 of an inning allowing a run on 2 hits and 2 BB. He had a K. Greenville was not scheduled. Lowell was shut out by Batavia 4-0. Jeff Vincent went 1 for 2. Bubba Bell went 1 for 3 . Jeff Farrell started and went 5 innings. He gave up 4 runs on 4 hits and a BB. He had 1 K. Jean Guillen was perfect for the next 2 innings. Felix Ventura threw the final inning. He allowed a hit and struck out 1. The Red Sox of the GCL were not scheduled to play yesterday. Player of The Night: Adam Stern who was 3 for 4 with a run scored. In action on Saturday, Pawtucket swept a doubleheader against Columbus by scores of 3-1 and 5-3. In the first game, Dustin Pedroia went 2 for 3 and scored a run. Ron Calloway went 1 for 3 with a run scored and 2 RBI. Jason Johnson pitched a complete game. He gave up 1 run on 4 hits and a BB in the 7 inning contest. He had 5 Ks. In the second game, Willie Harris went 2 for 4 with a run scored and a RBI. Ron Calloway went 2 for 3 with a home run and 2 runs scored. Trent Durrington went 2 for 3 with a run scored and a RBI. John Barnes went 4 1/3 innings and gave up 3 runs on 4 hits and 8 BB. He had 3 Ks. Phil Seibel finished up the final 2 2/3 innings. He did not allow a run, a hit or a walk and had 3 Ks. The Portland - Binghampton game was rained out. Wilmington defeated Lynchburg 4-2. Jay Johnson went 2 for 5 with a run scored and 2 RBI. Bryan Pritz, Claudio Arias, and Andrew Pinckney all went 2 for 5. Iggy Suarez went 3 for 4 and scored a run. Ian Bladergroen went 2 for 4 and scored a run. Five pitchers were used in the victory with Jason Richardson pitching 3 innings of relief giving up 1 run on 4 hits and 2 BB. He had 2 Ks. Bryce Cox got the win going 2 innings without allowing a run or a hit. He gave up a BB and had 3 Ks. Beau Vaughn pitched 2 innings allowing a run on 2 hits. He had 2 Ks. Greenville got by Savannah 7-4. Luis Soto went 2 for 4 and scored a run. Chris Turner went 2 for 4 with a run scored and 2 RBI. Chris Jones started and went 5 innings. He gave up 4 runs on 5 hits. He did not walk a batter and had 5 Ks. Tim Cox got the win going 3 scoreless innings. He allowed 1 hit and a BB while striking out 3. Lowell edged Batavia 4-3. Bubba Bell went 2 for 4 with a run scored and 2 RBI. Jeff Vincent went 2 for 4 and scored a run. Zach Daeges went 2 for 4. Brian Steinocher went 3 innings. He gave up 1 run on 2 hits and a BB. He had 2 Ks. Dustin Richardson got the victory going 4 innings. He allowed 2 runs on 3 hits. He did not give up a BB and struck out 2. T.J. Large finished the final 2 innings allowing 1 hit while striking out 2. The Red Sox game in the Gulf Coast League against the Twins was postponed. Player of The Night: Jason Johnson who pitched a complete game for Pawtucket giving up just 1 run on 4 hits. He allowed just 1 BB while striking out 5. On Friday the Pawtucket Red Sox were swept in a doubleheader by the Columbus Clippers. In game 1 the Pawsox fell 4-1. Abe Alvarez got the start and went 5 innings giving 3 runs on 7 hits while striking out 3 and walking 1. Jeff Bailey went 1-2 with an RBI and Adam Stern went 1-3 with a run scored in the loss. In game 2 the Pawsox got crushed 9-1. Marc Deschenes got the start and went 4 innings giving up 9 runs on 12 hits while walking 2. Dustin Pedroia went 1-3 with a double and a walk while Ron Calloway went 1-2 with a triple, walk and a run scored. Portland on Friday fell to Binghamton 8-7. Luis Mendoza pitched 5 innings giving up 6 runs on 10 hits and Edgar Martinez gave up 2 runs in 2 innings pitched to take the loss. Jacoby Ellsbury went 2-5 with a double, RBI and a stolen base while Jeremy West went 3-5 with an RBI and 2 runs scored. Wilmington got pounded at Lynchburg 13-6. Kevin Guyette and Justin Sturge combined to pitch 7 innings giving up 13 runs on 16 hits for the Blue Rocks. Jay Johnson went 2-5 with a homerun and 4 RBI while Jeff Corsaletti went 3-4 with a double and walk. John Otness also went 2-4 with an RBI in the loss. Greenville on Friday fell to Savannah 6-3. Ryan Phillips got the start for the Drive and went 5 innings giving up 3 runs only 1 of them earned on 7 hits while striking out 4 and walking 1. Aaron Bates went 2-4 with a double and Chris Turner went 1-2 with a double and run scored and 2 walks. Dustin Kelly also went 2-4 in the loss. Lowell got past Batavia on Friday 5-4. Kris Johnson got the start for the Spinners and went 2 innings giving up 1 unearned run on 4 hits while striking out 1. Josh Papelbon pitched 1 inning with a strikeout to record his 4th save. Bubba Bell continues his hot streak as he went 3-5 with a homerun, triple, RBI and 2 runs scored. Zach Daeges went 3-4 with an RBI and Ryan Khoury went 2-5 with a double and a run scored. And finally the GCL Red Sox fell to the GCL Reds 2-1. Jose Marte got the start and went 2 innings giving up 1 run on 2 hits while striking out 2 and walking 1. Pedro Vasquez went 2-4 while Jon Egan went 1-4 with a run scored. Carlos Fernandez went 1-4 with a double and an RBI in the loss. Player of the Night: Bubba Bell who went 3-5 with a homerun, triple, RBI and 2 runs scored in the win. On Thursday the Pawtucket Red Sox won 9-8 over the Toledo Mud Hens. David Pauley got the start for the Pawsox and went 5 innings giving up 7 earned runs on 11 hits while striking out 7 and walking 1. Barry Hertzler pitched a scoreless inning of relief. David Murphy went 2-5 with 2 RBI and a run scored and Jeff Bailey went 3-5 with a walk and 2 runs scored. Ron Calloway went 1-5 with the game winning 2 run homer for the Pawsox. In Portland the Seadogs were beaten by Binghamton 7-4. Devern Hansack got the start and went 5 innings giving up 4 runs only 2 earned on 9 hits while striking out 5 and walking 3. Brandon Moss and Chad Spann each went 2-4 with a run scored and Jacoby Ellsbury went 1-5 with a run scored and a stolen base. Wilmington on Thursday beat Myrtle Beach in the series finale 4-1. Andrew Dobies pitched 6 solid innings giving up no runs on 3 hits while striking out 5 and walking 2 to pick up his 8th win of the season. Jay Johnson went 3-5 with a double, triple and 3 RBI. John Otness and Jeff Natale each had 2 hits in the win. In Greenville the Drive beat Savannah 2-1. Michael Bowden got the start and was dominant once again giving up 1 unearned run on 4 hits while striking out 6 with no walks. Kyle Fernandes pitched 3 shutout innings with 3 strikeouts to pick up the win. Christian Lara went 2-3 with a double, RBI and also stole his 25th base of the season. Aaron Bates went 1-3 with 2 strikeouts in his debut with the Drive. In Lowell the Spinners lost to State College 10-2. Travis Beazley went 4 1/3 innings giving up 4 runs with 3 of them earned on 6 hits while striking out 3 and walking 2. Justin Materson pitched a scoreless inning of relief striking out 1. Zak Farkes went 3-4 with a homerun and 2 RBI and Bubba Bell also went 3-4 with a double. Michael Chambers also went 2-3 with a run scored in the loss. And finally the GCL Red Sox beat the GCL Reds 3-2. Felix Doubront got the start and was dominant in 6 innings giving 1 unearned run on 3 hits while striking out 5 to lower his ERA to 1.74 for the season. Carlos Fernandez went 3-4 with a double and a run scored and Michael Jones went 2-4 with a double. Argenis Diaz went 1-4 with a triple and 3 RBI in the win. Player of the Night: Felix Doubrant who pitched 6 dominant innings giving up 1 unearned run on 3 hits while striking out 5 to lower his ERA to 1.74 for the season. What was your assessment of the Red Sox draft and what grade would you give them? Which of the tough signs do you think the Red Sox will sign (Belt, Anderson, LaPorta, Giardina)? After Place it was a pretty pitching-heavy draft at the top – a lot of it will come down to what Bard signs for. Personally, I don't think he's going to get what he's asking for, nor does his talent warrant it. With those late picks, we're just going to have no idea about their signability until the Bard deal is done (or not done – highly unlikely), as that deal has a big impact on their budget. The one guy I really think is NOT going to sign is Anderson. With Lester, Hansen, Delcarmen all graduating to the Big Leagues who are your top 10 Red Sox prospects in order? All in good time. I'll be doing a top 10 for every team after the season. To just give you one now would be sloppy – to do them right it takes a TON of research and conversations. While you said he is not a SS, can Jed Lowrie hit enough to be a legit top prospect? Depends on what your definition of top prospect is. I think he can hit enough to be a good prospect, but not a bigtime one. How bad was Bowden's command in high school? Could there have been misinformation? It doesn't seem likely that a first year player out of high school could have a 2.2 BB/9 if his control kept him out of the first round. Bowden only walked nine hitters last year in high school. I'm not sure what you are basing that on, but there's a significant different between command and control. Plenty of guys can throw strikes, but not all of them can throw effective strikes. Big difference. I'm a huge Bowden fan, for what it's worth. Very good pitching prospect. Your arrival at BP coincedentally occurred a couple weeks after the Jon Lester fiasco. Now I'm sure such a move was in the works before that came to be. My question is this: Does BP plan on using your anecdotal/observational information into their minor league PECOTA projections? Part B) Were there any conversations regarding Lester's placement and how to avoid obvious mistakes like that from happening again? A. No. PECOTA is a purely statistical system, and to add that information would require a quantification of anecdotal information. Garbage in, garbage out. B. I've had no conversations regarding what did or did not happen with Jon Lester. Our goal is to obviously continually be better at what we do, and I was brought in to give them somebody committed on the prospect beat. You will get a top 50 list (or more) next year, and as the first person at BP dedicated solely to this beat, it will come from me – and I can promise that the amount of time put into getting it right will border on ridiculous. Despite how far prospect analysis has come, we still find ourselves starved for information on players from the Rookie leagues. Have you heard any tidbits on: Carlos Fernandez, Luis Sumoza, Felix Doubront, Chieh-Hsien Chiang, Reid Engel, Luis Exposito? I'm guessing you guys have as much as I do on them concerning their tools and background. I'll have some folks down in Florida going to GCL games, but none of them have seen the Sox yet. Where would you place Aaron Bates' ceiling? Can you think of a similar major leaguer? I think he could become an average big league hitter – it's very hard to make it as a first baseman – you have to MASH to get there at that position. In a perfect world he's maybe an unathletic Austin Kearns? It's weird, because he's a 1B, but he's right-right. The Sox FO is believe it or not, very secretive about the way they conduct their minor league business. But recently Theo Epstein has explained that they give each of their prospects a certain number of goals they must accomplish to advance to the next level. I'm sure this is similar to what other organizations do. Do you know if these goals are mostly only statistical (walk X times/ PA, take X pitches/PA) or non-statistical (hit the ball up the middle, keep the ball down in the zone)? I don't know if they're any more secretive than any other org, but almost every team gives goals to prospects. They are non-statistical -- identifying areas of improvement. To give purely statistical goals would be silly. You tell a guy that he has to walk 50 times, and while his walk rate goes down, he's hitting .325 with power – you don't promote him? How highly do you regard Clay Buchholz and Michael Bowden? I like them both very much as solid starting pitcher prospects. Easy top 10 guys in the org for me. I like Bowden a little better. I believe that the Sox should basically re-build Daniel Bard from the ground up. Whether intentional or unintentional, I'm extremely unimpressed with the job the UNC coaching staff did with his development. It seemed like he was able to survive on natural ability every game I watched. Rarely did I see a strategy in place to attack hitters. And his breaking and off-speed pitches were not impressive. Should the Sox start Bard in Greenville next year and basically re-build him as a pitcher, though obviously utilizing his natural abilities. I don't know how to answer this question without being a jerk. Can I ask what qualifications the person who asked this has that makes him better and/or smarter than the coaching staff of an elite college program that just led their team to the finals of the college world series? I don't get this kind of thinking. I don't know what you mean by re-build, or how one goes about re-building. The big problem with Bard is arm slot, plain and simple. When it's high, he's good. When it drops, he loses velocity and a second plane on his slider. I'm quite sure the Red Sox know that, and I'm quite sure UNC knew that, and did everything they could to try to get it more consistent. Daniel Bard, what's your take on his secondary pitches? Also, during the CWS, he was hitting 97 and 98 repeatedly with a ridiculously easy motion. Was the gun juiced, or does he really sit high 90's? He may have been sitting there, as I'm sure he was pumped up, but the TV guns are almost always a little juiced. Bard definitely can fool you though, because like you say, it comes out of his hand very easy. I like his breaking stuff – again, when his arm angle is right. We've been salivating over Bryce Cox after seeing him in Omaha. How soon do you think we can reasonably expect to see him in Boston? I think Cox was a potential steal, but let's not get too far in front of ourselves yet. He's barely spent a week in Lowell. I would guess his perfect timetable, with no bumps in the road would get him there in early '08. After graduating most of the top prospects to the big league roster, the upper minors are a bit bare right now. Still, there seems to be a decent crop in A ball and what seems to be an excellent influx of talent this year from the draft, 2005 DFE's, and international signings. Realistically, where do you see the Sox farm being rated this winter? Above-average, but not elite. At first thought somewhere in the 9-15 range or so, but that's just a first-thought kind of response. So far your Mark Wagner pick seems to be hitting. Luis Exposito is also off to a good start in Lowell . What's your take on Exposito, and what do you think of both players compared to each other? I'd give Exposito the edge based on his youth and tools. Wagner is a better baseball player (if that makes sense). Which would you prefer and/or rate more highly as a prospect and why? A) Non-toolsy, baseball rat guy producing at every (age appropriate or better) level up through to AAA? Let's call him Pustin Medroia.or B) Super-toolsy guy currently stuck in A ball who hasn't produced at any level since the DSL/VSL or rookie leagues and hasn't progressed either?Let's call him Moises Blanco Soto. It depends on tools and what scouts tell you really. Ranking prospects is tricky, because you have to factor in both ceiling and distance from ceiling and figure out how to balance them, and that balance is different for every guy. Who do you prefer? The guy with a 85% of becoming a big league regular and 5% chance of being a star – or the guy with a 25% chance of becoming a big league regular and a 20% chance of being a star? You want to put you money in savings bonds where it's guaranteed? Or tech stocks where you could lose it all or end up winning the lottery? Do you believe that Mark Wagner is for real? Did the Sox grab a steal out of the 9th round in 2005? For real? Sure, but that's pretty vague. I think he has a chance to get to the big leagues, as a spot starter/backup type. That's certainly better than most 9th round guys. Could Zach Daeges be this years Youkilis or Wagner (mid round college bat that produces while going up the system)? I don't think Wagner is anywhere near in Youkilis' category, and I don't think Daeges is in Wagner's category – so I guess no. David Murphy - 4th OF or possble starter? If the latter, CF or corner OF? Is he a poor man's Trot Nixon? Or is he the second coming of same? He's certainly not the next Nixon, but I do like him. I think he'll have a lengthy major league career as a 4 th outfielder/occasional starter who can hit a little and play all three outfield positions. What has been the biggest philosophical change in your evaluation of prospects since moving to BP? None. Nor was I asked to make any. That said, I try to get better at what I do constantly. Every time I talk to a scout or a scouting director or a PD guy or a GM or really anyone in this game, I learn not only something about specific players, but something about the bigger picture in general. Who would you rather sign (money being equal) Lars Anderson or Matt LaPorta? Anderson, by a slight margin. Are you at all concerned about Ellsbury's lack of SLG % at this stage, I understand Wilmington isnt very condusive to XBH, but it still seems low for someone who should be getting more doubles and triples? I'm pretty surprised by the lack of doubles, but I think his triples and home runs are in line with expectations. He also hit very few doubles last year at Lowell, so yes, there is a tiny concern there. The baseballanalysts.com site recently compared Trevor Crowe, Jacoby Ellsbury and Brett Gardner and came to the conclusion that Crowe is the best of the three (without looking at defense). In your opinion how would you rank the 3, and does Gardner have a shot at being a MLB regular or is his K rate too high? I would rank Crowe ahead of Ellsbury, and both of them ahead of Gardner. I don't think Gardner will hit enough to be an every day player. Who are the top 10 pitching prospects currently in the minors? I'm currently doing our positional rankings at BP. Third baseman is on Thursday, so it'll be a month or so before I get to arms. Dustin Pedroia sparks intense debate, even around here. Where do you come down on him? Total bust, decent major leaguer, good major leaguer, perennial All-Star, or the man who will revolutionize baseball and bring peace to the Middle East? I think you called him something like a solid major league regular before ... what would be a ballpark projection during his peak years? And has his year this year (slow start, good after that) changed your view at all? I see Pedroia pretty much exactly where I saw him going into the season, and a solid middle infielder, but not a star. I think he'll have a few seasons in the .290/.360/.420 range, and that's pretty damn good. If he could bring peace to the Middle East I'd like him so much more, last time I was at the Middle East it was in the early 1990s for a Mighty Mighty Bosstones show and it was anything but peaceful. Woohoo! Boston joke! Playing to the crowd! Chad Spann has put together a very nice half-season in AA after a couple of disappointing years. Should he be on the radar as a prospect? Overall impressions? He should be on the radar, but it's not a very bright blip. He can definitely hit, but I'd like to see some sort of step forward in his secondary numbers. Thoughts on Caleb Clay and Kris Johnson, stuff and future? It's funny, I was shocked that Johnson lasted to 40, and then I was surprised to see Clay go as high as 44. I really like Johnson's chances – he's much more than a control/lefty – his low 90s velocity could make a huge difference. I thought he was a great pick. Clay might be a little TOO raw for me, but I understand the chance. Why isn't anybody asking about Justin Masterson – I really like him as a reliever. The pre-season BP Lester ranking/non-ranking …what happened? What was the honest reasoning for not ranking Lester and then ranking him 50th? Do you stand behind the decision making that lead to this or do you think this was an error? How will your methods for ranking prospects in 2007 change? The BP methods for ranking prospects will change in that I'll be doing them. Zach Daeges was one of my favorite players going into the draft, but do you think his power will translate as well in the pros as it did when he won the triple crown in the Northwoods league? Does his age and college competition worry you, or is his power + plate discipline package legit? He's a solid hitter, but he doesn't really have a defensive home, and he doesn't really have much projection. That's why he lasted until the 9th round. Is Luis Soto penciled in as a top 5 prospect in this system now that the big arms have graduated to the majors? No. Maybe bottom of Top 10, but I haven't done all the work yet. Do you have enough confidence in Daniel Bard's secondary pitches for him to remain a starter? We've heard the rumors, but it certainly looks like he has the arm and motion to easily pump fastballs all day long. Yes. He has enough stuff to be a starter, and he's also highly durable. Ian Bladergroen - he's had flashes of good play, but has been largely inconsistent this year in a tough ballpark for lefties. Do you think he will continue to rebound or ever see the level of play he showed in 2004 again? I talked earlier about how hard it is to make it as a first baseman, and now we're talking about one in the Carolina League with pretty pedestrian numbers. Not much to be excited about there. Have you also been hearing anything about Manny Arambarris this year? He's off to a nice start, but I've heard he's a little stiff both at the plate and in the field, and people are very mixed on his power projection. What are your thoughts on Kason Gabbard? Ton of ground balls this year, good K/BB, but repeating AA for the 3rd time. Think he's a real prospect, or is the stuff just too much of a question mark? He's certainly gone from org guy to at least some kind of prospect. I don't think he's got enough stuff to start in the big leagues, but his length and mechanics create a lot of deception, especially to left-handed batters, and he could end up to be a decent bullpen arm. What is wrong with Mike Rozier? He signs for 1st round money, Gammons says he hits 95mph from the left side in instructionals in 2004, then he spends 1.5 years (thus far) in low A with unimpressive stats. Is he another guy like fellow Sox (non) prospect Luis Mendoza who has "great stuff", but can't seem to miss bats? Has he lost his stuff? Did he ever have "stuff"? Any potential to improve or is he a lost $1.5M? We've all heard about is "work habits", but if he learns his lesson from this off season, could he become a prospect? Rozier still has plenty of time to turn things around, but yes, he's been a massive disappointment. The last person I talked to who had seen him pitch recently said he rarely touched 90, and that's obviously a significant concern. He's still just 21 – but it's definitely not gone as planned. I wouldn't write him off yet – but I might think about drafting up the paperwork. In Pawtucket the Pawsox beat the Toledo Mud Hens on Wednesday 6-3. Charlie Zink got the start for Pawsox and went 5 innings giving up 3 earned runs on 5 hits while striking out 3 and walking 6 to earn the win. Javier Lopez pitched 2 scoreless innings with 2 strikeouts and earned the save. Luke Allen went 3-3 with an RBI and a run scored and Adam Stern went 2-5. Ron Calloway went 2-3 with an RBI and a run scored while Dustin Pedroia went 1-5 with a triple and a run scored in the win. Portland on Wednesday shutout New Hampshire 6-0. Jose Vaquendano pitched 7 strong innings giving up no runs on 6 hits while striking out 7 while picking up his 7th win of the season. Luis Jimenez went 2-5 with 2 homeruns, 3 RBI and 3 runs scored while Brandon Moss went 3-5 with a double, RBI and a run scored. Chad Spann and Jeremy West also had 2 hits apiece in the Seadogs win. Wilmington beat Myrtle Beach on Wednesday 1-0 in 11 innings. Matt Goodson started for the Blue Rocks and went 6 innings giving up no runs on 2 hits while striking out 6 and walking 3. Scott Shoemaker also pitched 4 scoreless innings. Chuck Jeroloman went 4-5 with a double and had the game winning RBI in the 11th. Jeff Corsaletti also went 1-2 with 3 walks in the win. In Greenville the Drive beat Savannah 7-2. Clay Buchholz got the start and went 5 innings giving up 2 earned runs on 2 hits while striking out 5 and walking 1. Ismael Casillas also had 3 hitless innings of relief with 5 strikeouts. Tony Granadillo went 2-4 with a homerun, 2 RBI and a run scored and Dominic Ramos went 3-4 with 2 doubles, 2 RBI and 2 runs scored. Christian Lara also went 2-3 with a run scored while Mark Wagner went 1-4 with a homerun. In Lowell the Spinners pounded State College 12-4. J.T. Zink got the start and went 4 1/3 innings giving up 4 earned runs on 7 hits while striking out 1 and walking 1. Bryce Cox pitched 2 scoreless innings of relief striking out 2 and Josh Papelbon finished it off with a scoreless inning. Michael Chambers went 3-5 with 3 RBI and 2 runs scored while Bubba Bell went 3-5 with a homerun, double, RBI, 5 runs scored and 3 walks. Reid Engel and Luis Exposito each went 2-5 with 2 RBI and Aaron Bates went 3-4 with a double, 2 RBI and a run scored. And finally the GCL Red Sox and GCL Pirates game was suspended in the bottom of the 3rd inning with the GCL Red Sox leading 2-0. Player of the Night: Bubba Bell who went 3-5 with a homerun, double, RBI, 5 runs scored and 3 walks in Lowell's 12-4 win over State College. The Boston Globe is reporting that Tim Wakefield will go on the DL with a fractured rib retroactive to July 18, and Pawtucket lefty Kason Gabbard will get the spot start in Wakefield's absence. Previously this season, the 24-year old southpaw dominated the competition in AA Porltand, going 9-2 with a 2.57 ERA in 13 starts, but struggled somewhat after a promotion to Pawtucket, where he has gone 1-3 with a 4.97 ERA in 5 starts. In other Red Sox news, Josh Beckett signed a three year contract extension. Terms were not disclosed. In Pawtucket the Pawsox and the Toledo Mud Hens were suspended until 6:05pm tonight when they will resume the game in the bottom of the 9th. The Portland Seadogs were beaten in New Hampshire by the Fishercats 9-7. Frank Brooks got the start for the Seadogs and went 4 2/3 innings giving up 4 earned runs on 8 hits while striking out 4 and giving up 3 homeruns. Brandon Moss went 3-5 with 2 RBI and a run scored while Chadd Spann went 1-4 with a double and a run scored in the loss. Wilmington's game with Myrtle Beach was suspended and will resume in the bottom of the 7th inning at 5:05pm tonight. Greenville capped its road trip with a 6-4 win over the Rome Braves. Mike Rozier got the start for the Drive and went 5 innings giving 3 runs with only 1 of them earned on 6 hits while striking out 3 and walking 3. Luis Soto went 2-5 with a homerun, an RBI, and 2 runs scored and also had an outfield assist. Chris Turner and Logen Sorensen each had 2 hits and an RBI and Tony Granadillo went 1-2 with 3 walks and 2 runs scored. In Lowell the Spinners were beaten by State College 3-1. Mario Pena got the start for the Spinners and went 6 innings giving up 2 earned runs on 5 hits while striking out 4. Josh Papelbon went 1 inning and had a strikeout. Zach Daeges with 2-4 with a double and a run scored and Luis Exposito went 1-3 with a double, RBI, and a walk in the loss. And Finally the GCL Red Sox played a doubleheader on Tuesday against the GCL Pirates. Game 1 went to the Red Sox 5-2. Ryan Colvin got the start and pitched 2 scoreless innings giving up a hit and striking out a batter. Joseph Guerra pitched 5 innings in relief for the win. Chih-Hsien Chiang went 2-3 with his first professional homerun. He also had a double, an RBI and scored 2 runs. Kris Negron went 2-3 with a double and a stolen base in the win. In Game 2 the GCL Red Sox fell 6-5. Emilis Guerrero went 3 innings giving up 2 runs on 2 hits while striking out 2 and walking 3. Pedro Vasquez went 3-3 and Emilio Linares went 2-4 with a double. Matt Sheely went 2-3 with a double in the loss. Player of the Night: Chih-Hsien Chiang who went 2-3 with a homerun, double, RBI, and 2 runs scored in the GCL Red Sox 5-2 win. It was the first professional homerun for Chih-Hsien Chiang.